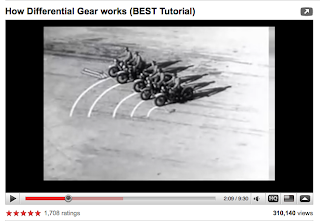 Because 1930's physics lessons are amazing (and still apply 80 years later). On July 30. 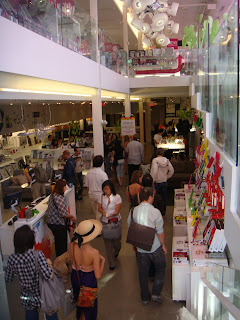 2009 National Design Collective attended the Umbra Concept Store "Kaleidoscope" for their new colour story product launch. We arrived right on time and there was already a huge line up outside the store, creating an unnecessary hype. Their new product consists of more picture frames and the new "colors" for the products were primary red, yellow, spring green, and their signature pink. 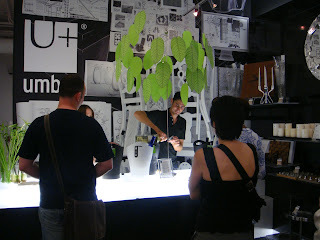 There was an under-lit bar at the back of the store, serving white or red wine. They used Karim's famous garbage bin "Garbo" as the wine cooler. 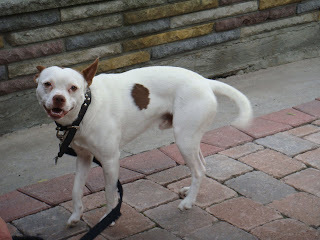 Side note: ever wonder what happens when a chihuahua and a pit bull makes? Oh and also "any entrants who actually get a real permanent subcutaneous Fat Cyclist knuckle tattoo will be automatically disqualified"
Explained by Scott "it's the thing that the crank attaches to and makes your bike go"
The entry was named by Bike Snob NYC as "Knuckle Pants". 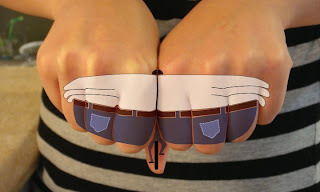 The fat cyclists back mass is spread across 7.5 knuckles, while the thin legs and back wheel are printed onto the thumb. 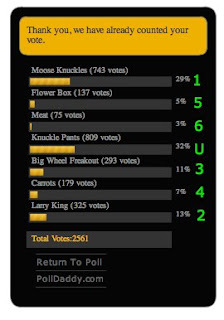 7 finalist were chosen and after 24 hours of "peoples choice" voting. NDC won by 66 votes!! winning the ultimate UBER PRIZE! 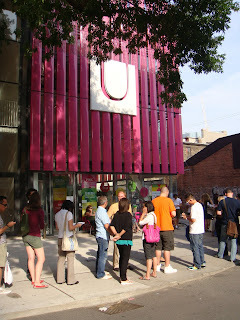 Results from the poll - U stands for UBER! Recently got back a batch of laser cut leather, and spent some time finishing a bag. 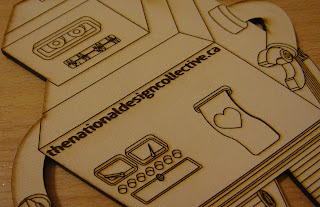 The leather was cut out to make some self-branded coasters, and a prototype hand bag. 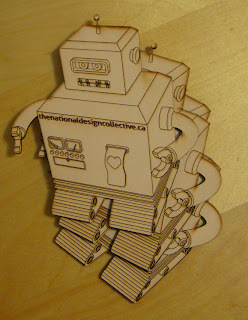 The robot was made in Solidworks, and then exported as vector graphics to manipulate in Illustrator. These pics are from when the coasters were new, but they have since softened with use, and darkened with all of the liquids spilled on them. They were intentionally left unfinished so that this would happen. 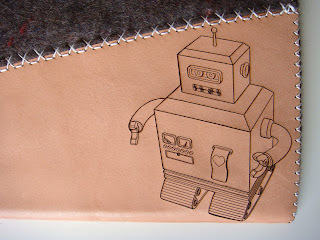 The rest of the leather was used to create a prototype tote-bag. 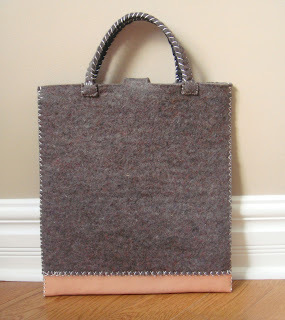 The leather is used for the bottom of the bag for durability, and 1/4 inch thick felt is used for the upper, and handles. Holes in the leather were cut to help out with properly spacing the stitching. The robot was etched into the front panel, along with some stripes. 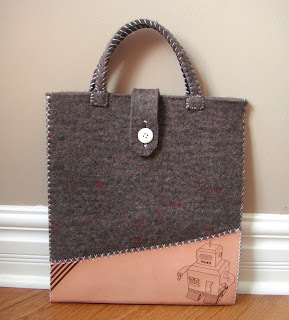 The top of the bag has a strap that buttons on the front to keep the bag closed. The handles are sewn on, and backed with webbing for strength. Leather is a fun material to work with, but the "etching" function seems to be a little bit too powerful, cutting about halfway through the material.